United Nations, Feb 13 (IANS) The hardline US National Security Adviser John Bolton has issued a warning to India against buying Venezuelan oil, saying it "will not be forgotten" and that Venezuela's Foreign Minister Jorge Alberto Arreaza has countered that it was an attempt to impose Washington's global "dictatorship". 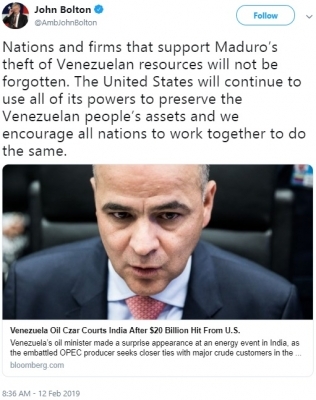 Bolton tweeted on Tuesday: "Nations and firms that support (Venezuelan President Nicolas) Maduro's theft of Venezuelan resources will not be forgotten", and displayed with it a news story about Venezuelan Oil Minister Manuel Quevedo visiting India to sell more oil. His tweet continued with the warning: "The US will continue to use all of its powers to preserve the Venezuelan people's assets and we encourage all nations to work together to do the same." President Donald Trump's administration and its allies have recognized opposition leader and National Assembly President Juan Guaido as the Latin American nation's President and have called on Maduro to quit. The US does not consider that Maduro's government has the right to sell the country's oil -- and hence, calls the oil exports "theft". Reacting to Bolton at a news conference here, Foreign Minister Arreaza, who represents Maduro, said: "What he (Bolton) is trying to do here is give orders. This is a dictatorship that they are trying to impose on the world. Unilateralism at its maximum expression." He asserted that because of Bolton's attitude "there was a rebellion against this, this dictatorship" at a meeting of the representatives of the Non-aligned Movement earlier Tuesday at the UN. Bolton made a similar threat against India buying oil from Iran when Trump placed a more stringent international trade embargo on Tehran last year after withdrawing from a nuclear disarmament agreement made with it and five other countries. However, Trump gave India a temporary exemption from the embargo, which carried economic penalties for violations. Facing an embargo on its oil exports by the US and most western countries, Venezuela is trying to increase sales to India and other countries. Venezuelan Oil Minister Manuel Quevedo, who is in New Delhi to attend the Petrotech 2019 trade event, told reporters there on Monday that his country wanted to double the current oil exports of 340,000 barrels per day to India. Venezuela is the third largest supplier of oil to India. Reliance Industries and Nayara Energy are its biggest customers. Quevedo, who also heads the state oil company Petroleos de Venezuela, met India's Petroleum and Natural Gas Minister Dharmendra Pradhan on Monday. Venezuela has the world's largest known reserves of oil estimated at more than 300 billion barrels - bigger than Saudi Arabia's 266 billion barrels. India, which is wary of foreign interference in internal affairs, has refused to go along with the US and recognize Guaido as the President and stop dealing with Maduro's administration. "India and Venezuela enjoy close and cordial relations. We are of the view that it is for the people of Venezuela to find political solutions to resolve their differences through constructive dialogue and discussion without resorting to violence," External Affairs Ministry spokesperson Raveesh Kumar said last month. The simmering dispute over the May 2018 presidential elections, which the US and the Venezuelan opposition say was not fair, erupted into a crisis when the National Assembly on January 10 declared it invalid and Guaido proclaimed himself as the interim President. Since then there have been massive protests by supporters of both the government and violence has claimed more than 40 lives, according to the UN. The oil-rich country is also facing a humanitarian crisis with severe shortages of food and medicines. At his news conference, Arreaza said the Maduro government was ready to talk with the opposition, but without preconditions. "Let's sit down together. We have our Constitution. Let us sit down and engage in dialogue. Let us try to find a solution without any kind of strings attached, or any kind of preconditions," he said. Trump has ratcheted up Venezuela to his top foreign policy issue and said that US military intervention was an option. One of the problems for Venezuela's trade is that international banks are coming under increasing international pressure from the US. Quevedo told reporters in New Delhi: "How payment is made is for the buyer and seller to decide. It can be in currency, it can be through other transferable methods and channels." He floated the idea of a trade group with Venezuela, India, China and Russia whose commerce "doesn't necessarily have to be within the dollar".